Add a magnet to your Telehander equipment and pick up metal debris while you work. Why use a Telehandler magnet? 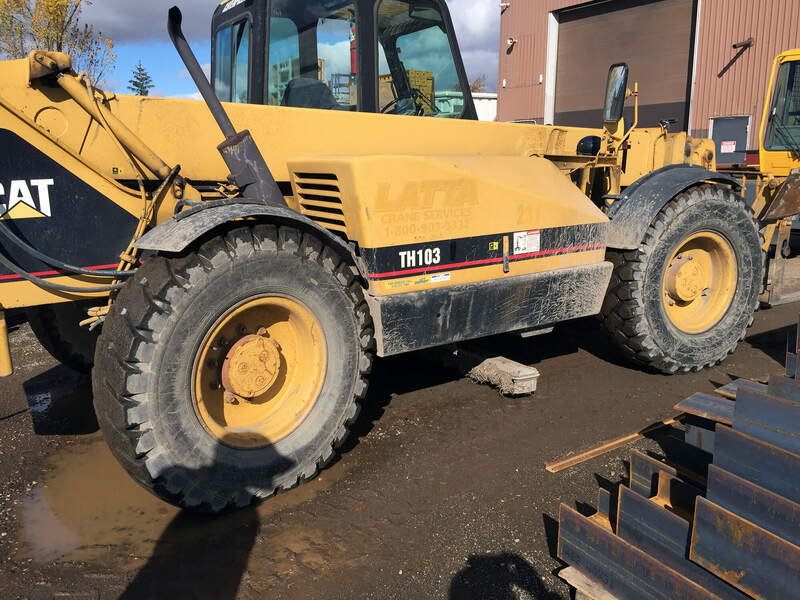 Telehandler magnets pay for themselves quickly by preventing flat tires and downtime of equipment, and repair costs. Hanging Magnets are the obvious choice for Telehandlers and are either hung from the rear bumper or underneath the telehandler between the front and rear wheels. 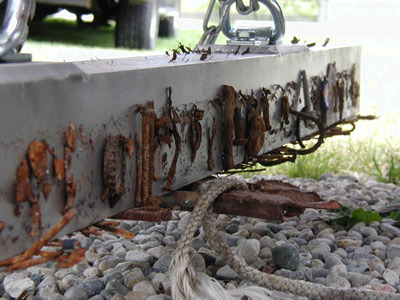 This type of Telehandler magnet is usually meant to be permanently mounted. What do the staff of Bluestreak have to say on the subject of Telehandler magnets? Clean the magnet off more frequently because I’ve seen them completely covered with nails, screws and metal debris so much so that the amount of debris stuck to the magnet now makes it quite hard to clean off, and when extremely covered with debris like that the magnet isn’t as effective as it could be, so clean the magnet off more often! 1. What type of debris do you want to pick up? Make sure the magnet strength matches the type of debris you expect to be picking up. If you want to pick up heavy metal debris a light weight small magnet probably won’t do the job. 2. What terrain and in what conditions will you be working in? 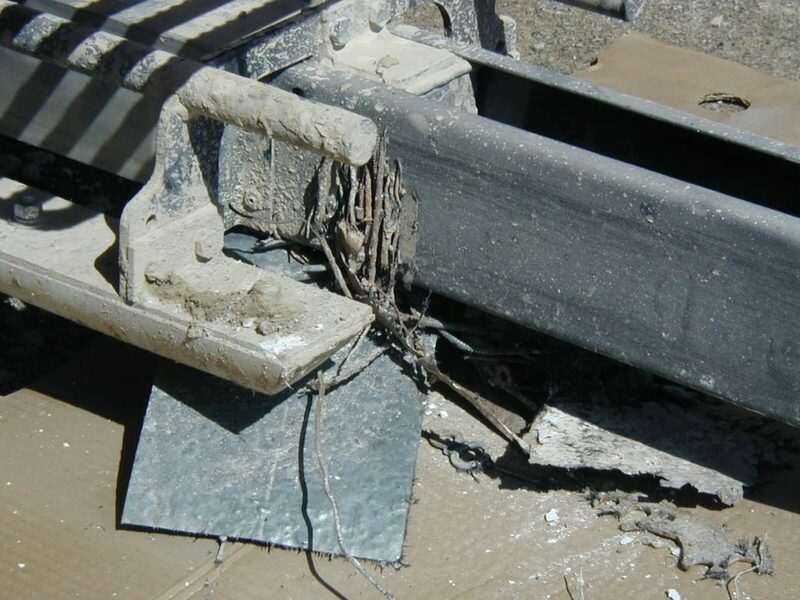 The rougher, dirtier terrain your Telehandler operates in the stronger the magnet your likely going to want, because the magnet will have to be set higher to avoid constantly hitting the ground. The magnet will also need to pick up debris through some dirt therefore you need a stronger magnet. The rougher the terrain that exists because of things like bumps and pot holes, more you will want or favor a magnet that has some protection built in to the design to either deal with the abuse of hitting the ground or being able to move out of the way when it does hit the ground in order to prevent damage. 3. How easy is the Telehandler magnet to clean off? A magnet may work really well at picking up debris, but how easy is it to clean off? Think through how you would clean the magnet off step by step. Make sure it makes sense to you and your situation. Pay attention to the details of how this will work right to the point of getting the debris in the garbage or scrap bin. 4. How good is the Telehandler magnet at hanging on to the debris that it picks up? Buy the biggest hanging magnet you can in terms of pickup strength to maximize effectiveness, yes you’ll spend a bit more on the magnet but it will be worth it and keep in mind hanging magnets are a really economical magnet option because you’re just paying for a big magnet bar so don’t skimp on it. Cleaning off hanging magnets is easy with a Quick Clean Off Sleeve. Just pull the sleeve off and all the metal debris falls off the one side of the magnet. A hanging design for flat surfaces. 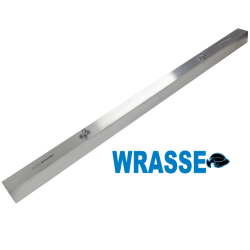 The Wrasse magnetic bar is for flatter surface use because this is essentially a large bar magnet that doesn’t come with any protection if it hits the ground. However, the Wrasse makes sense for Telehandlers operating on flatter surfaces because it’s economical and you can hang the magnet from the front end, rear end, or between the front and back wheels with the two hanging chains that come standard with the Wrasse. Because the Wrasse comes in widths up to 98 inches wide you can get one to fit any size of Telehandler. The Wrasse also comes in three different magnet strengths and if you purchase the strongest one, an optional Quick Clean Off Sleeve is available. A Hanging Magnet Designed to Take a Hit. 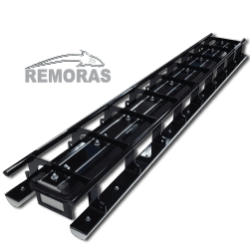 The Remoras magnetic sweeper is designed for handling rough outdoor uneven, rutted or pot hole filled conditions. It makes sense for Telehandlers operating in these rougher conditions because it comes with a protective cage around the magnet that protects and shields the magnet over it’s entire length from hitting the ground when Telehandler wheels dip into ruts, potholes etc. The Remoras also comes in multiple widths up to 98 inches wide, so you can get one to fit any size of Telehandler. 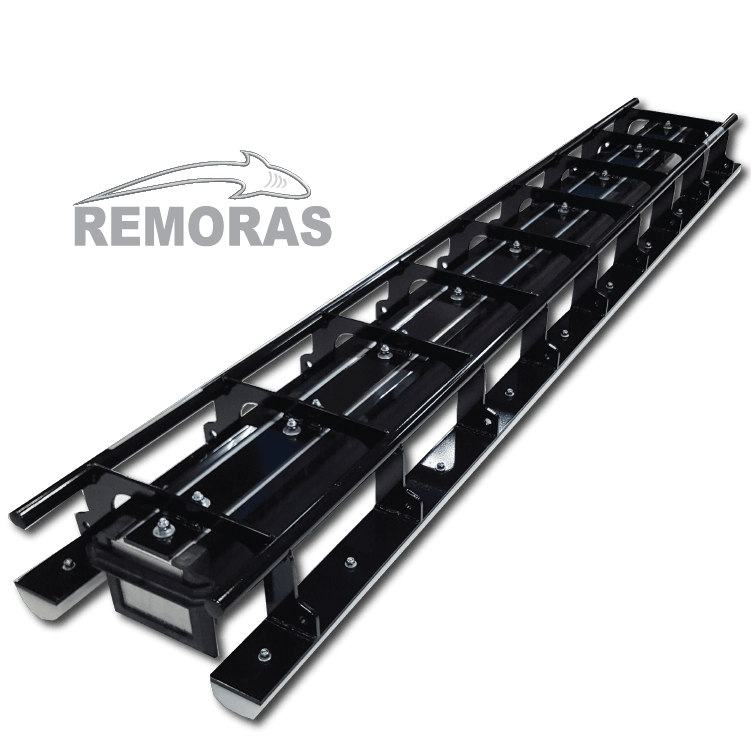 Because the Remoras was intended for rougher conditions it only comes in one magnet strength (which is the same magnet strength as the largest strength Wrasse model). A Quick Clean Off Sleeve comes standard on the Remoras. The Remoras also comes with four hanging chains. A Hanging Magnet Designed to be Raised and Lowered as Needed. The ISO magnetic sweeper is a hanging design that is a good option if you are working in areas in between a flat surface and a very rough outdoor terrain. 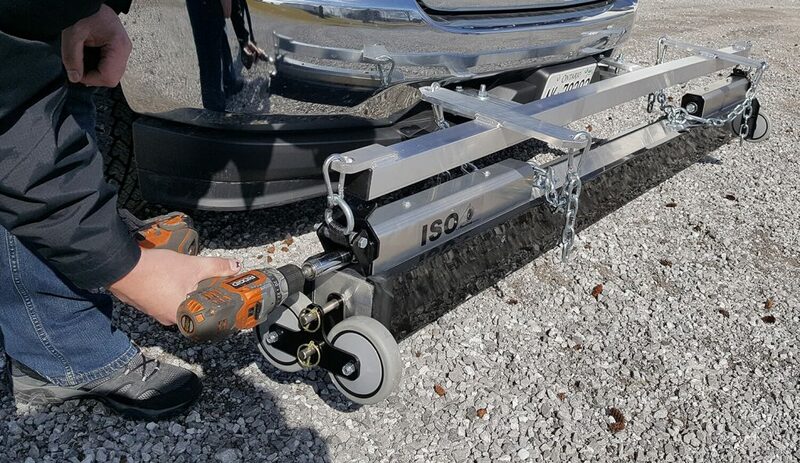 The ISO comes with “bumper wheels” on each end to prevent the magnet from hitting the ground on the ends. The ISO is a good option if your Telehandler is operating on concrete or asphalt surfaces that are uneven. It’s not a good option if your Telehandler is operating in dirt of gravel conditions because the bumper wheels won’t work well in dirt or gravel conditions. Because the wheels are only on the ends it also won’t protect the magnet in extreme rough conditions because it doesn’t protect the magnet over it’s entire length like the Remoras protective cage does. The Quick Clean Off Sleeve makes cleaning debris off the magnet easy! Keep it raised or lower it! Maximum Lifting Height 8 1/2" 4 3/4" 6" 8 1/2" 9"
Sweeper Widths 38", 50", 62", 74", 86", 98" 26", 38", 50", 62", 74", 86", 98" 26", 38", 50", 62", 74", 86", 98" 26", 38", 50", 62", 74", 86", 98" 62", 74", 86", 98"
Sweeper Height Adjustment Change suspension height by rising or lowering the chains to a specified maximum height of. 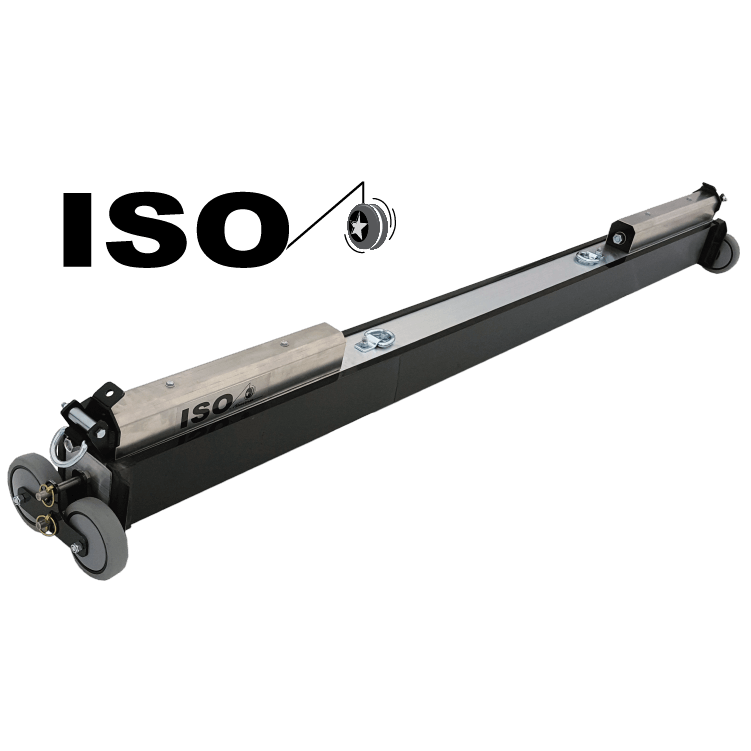 5" Change suspension height by rising or lowering the chains to a maximum height of 3". Change suspension height by rising or lowering the chains to a maximum height of 4". Change suspension height by rising or lowering the chains to a maximum height of 5". Continuously adjustable. Sweeper Wheel Type None None None None 5” Dynatread Thermoplastic Rubber wheels with polypropylene hubs and 5/8 inch ball bearings rated at 300 lbs capacity each.